!!! CWTS Fakes on eBay !!! The following update is provided to update more information to our membership in hopes that nobody gets stuck with some of the fake tokens that have appeared recently on eBay. Please be assured that a number of CWTS members are working on strategies to stop these. A number of these fakes appeared in late December, 2015 on eBay and were reported as fakes by several members. The listings disappeared shortly thereafter. Please be aware that a large number of positive feedback responses for an eBay seller may not mean much. eBay names with large positive feedback numbers can be purchased on the internet. Diligence is urged. If something seems too good to be true, it probably is. So far, all of the fakes have been coming out of Europe. CWTs in Europe? at should be a big red ag right there. Ask more experienced members if unsure about bidding. Always a good bet - either by tokens already in a "slab" or buy from reputable dealers. The newest is from Bulgaria. He very well may be one and the same as some of these other eBay seller names as shipped from Bulgaria even though he was listed as being from the Czech Republic. Some of the fakes look to be of the same type of manufacture as earlier reported fakes. Thee Ripon, Wisconsin piece (WI-720A-1a) is particularly poorly made. Others seem to be of the same odd coloring, fuzzy details, and o then displaying little "bubbles" indicating that they may be cast. they may be copper-plated over pot metal or some similar metal. 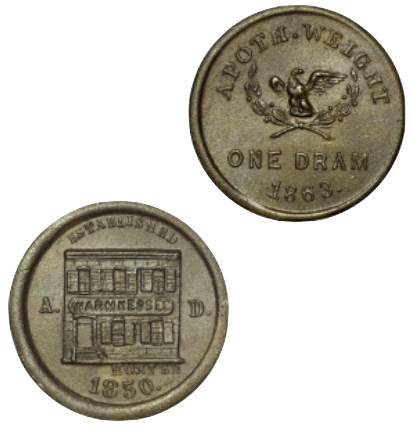 Sign up on Facebook for CWT Notes~stay informed about fake tokens, new finds and news of the Civil War Token Society!!! CWT Notes is a private/secret group on Facebook for members in good standing of the Civil War Token Society. Its purpose is for discussions of any and all topics related to Civil War exonumia. Any member of the CWT Notes group may nominate new members by following the procedures that are posted on the group’s main page. All such nominations are then given final approval by the group administrator(s). Alternatively, any active member of the Civil War Token Society who wishes to join the group on their own can simply send an email to one or both of the CWT Notes administrators, James Higby (cwtnotes@gmail.com) or Bob Metzger (ultrabob@verizon.net), and request that they be added to the CWT Notes group. They must be sure to clearly specify the email address associated with their personal Facebook account in that email, as well as their full name as known to the CWTS secretary, so that active membership in the Society can be verified.